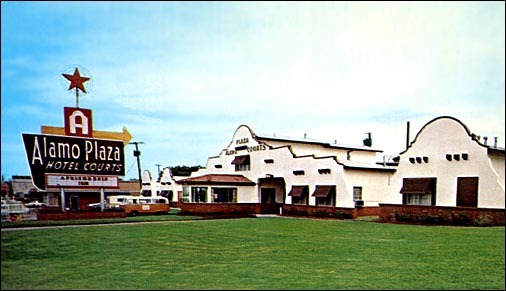 Reportedly a branch of the Farner/Mooney owned locations, the Dallas Plaza changed from its original ownership in 1976 when it was purchased by Chandrakant and Surekha Patel. 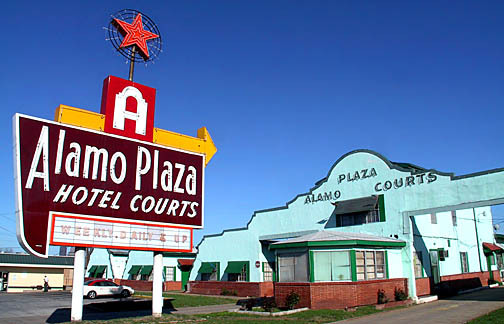 Immigrants from India, the Dallas Alamo Plaza launched their successful careers in the American hospitality industry. 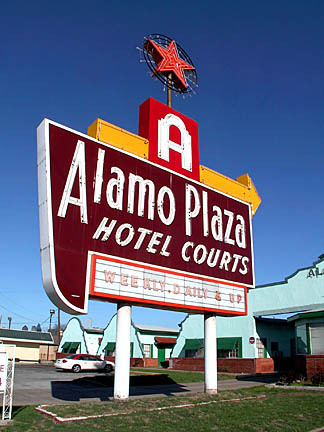 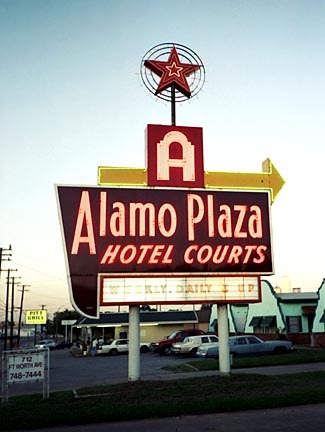 Its circa 1959 street sign was the last fully functioning example of a "great sign" that had been installed during Alamo Plaza's brief stint at franchising. 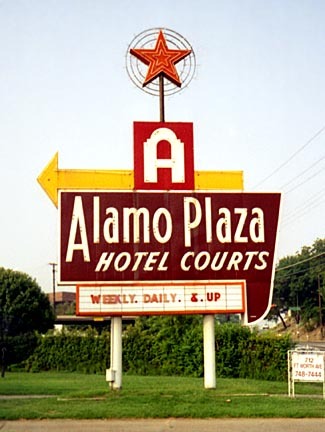 The sign, topped with its flashing arrow and star, stood some three stories tall beckoning motorists to turn in and "Spend the Night where the price is Right!" 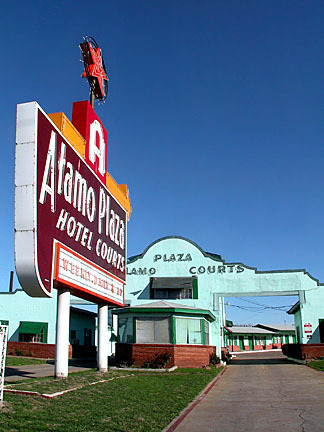 Postcard Above: Located 2 miles West on U.S. 80 Business 73 Comfortable units, varied, Spanish architecture. 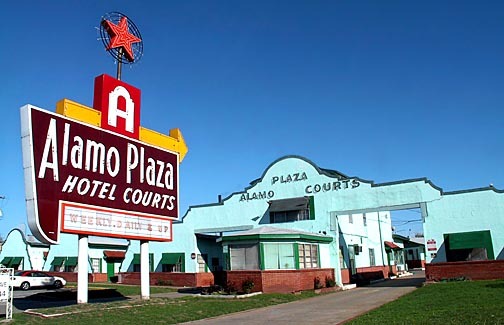 AC, Television, phones, coffee, room service, playground, kitchens, pool and restaurant adjacent. 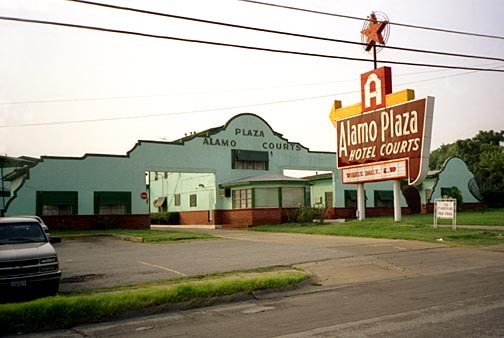 Like roadside strips in and around many American cities, the stretch of U.S. 80 just to the west of downtown Dallas was lined with businesses catering to motorists. 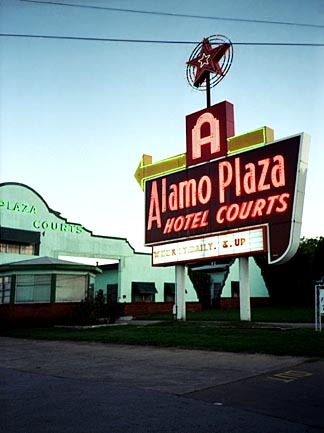 Roadside commerce thrived in the middle 20th century--huge flashy towering signs advertised gas, food, and lodging along the way! 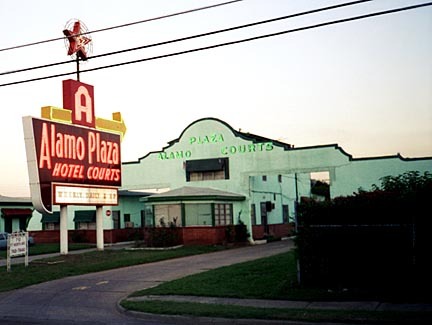 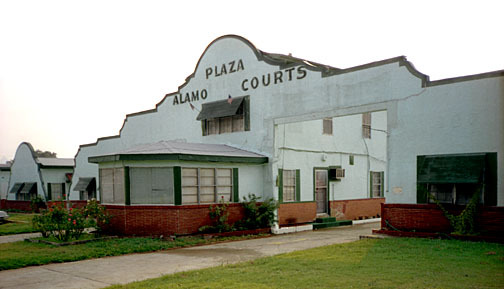 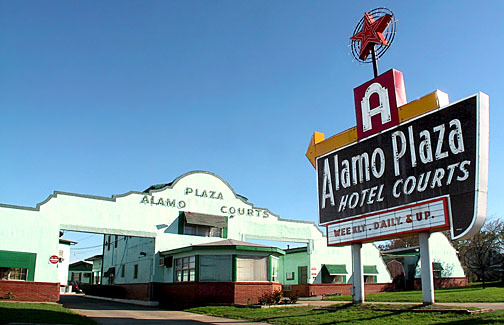 Scant evidence remains of the vibrant and colorful past save for archival photos, postcards, and a few spectular surving reminders like the Dallas Alamo Plaza.